Maggie Voth (Col '13) walked the Lawn for Final Exercises with her close friends, as many other graduates did. However, she may be the only student in her class whose father walked on same day. David Voth (Grad '12) finished his coursework for his M.S. in IT Management in September, but participated in Final Exercises in May with his daughter. We talked to the Voths about their graduation experience. 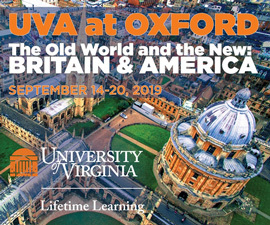 UVA Magazine: Was your daughter already a student at UVA when you started your graduate program? How did you break the news to her that you’d be joining her on Grounds? 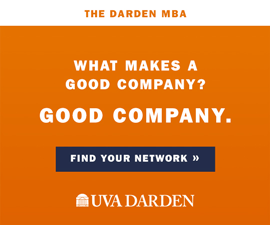 David Voth: Maggie enrolled at UVA in the fall of 2009, and from that point on our family felt connected to the University. We enjoyed attending fall football games, parents' weekends and her sorority parent formals. I didn’t apply to the Commerce School until the winter of 2011, and I began my graduate program that spring. On our first day of classes, Professor Stefano Grazioli asked us to introduce ourselves with a memorable fact. 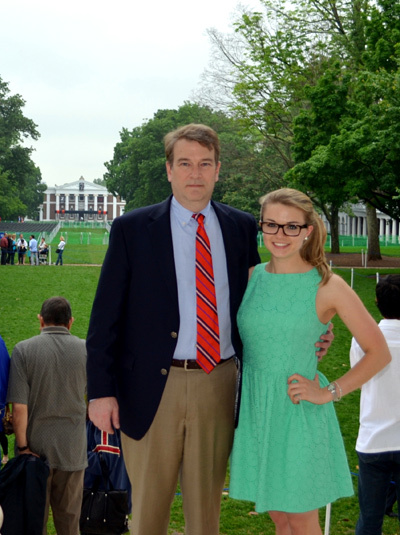 I shared that, if I finished the program, I would be graduating from UVA the same day as my daughter. If I recall, I broke the news to Maggie over the phone. She was surprised to hear I would be attending UVA as well. However, since the majority of my classes were held in NoVa, we were rarely on campus together. I think her only disappointment was that she always thought she would be the first person in our family to get a master’s degree! What was it like to walk the Lawn on the same day—did you walk together? DV: The whole Lawn experience was really unique and it was great to be part of the tradition. I walked with my fellow graduates from the Commerce School, and Maggie walked with her friends from the College. We met up briefly afterwards and then my diploma ceremony started right away down on the Lawn. Maggie had to dash over to the North Grounds Rec Center for her diploma. I left my ceremony early and headed over to catch hers. I didn’t have a ticket so, still wearing my cap and gown, I went around to the student entrance and after hearing my story, a nice guy let me in. You just graduated with your M.S. in IT Management. What motivated you to get a graduate degree? What are your plans for the future? DV: Throughout my career I had always wanted to get my master’s degree, but never had the time. Although challenging, the 16-month commitment, location and schedule for this program was a good fit. I have been in senior technology management positions for a while, but thought this degree was a great way to round out and formalize my education and credentials. I currently manage the technology organization for a mortgage services firm and am assisting them through a high growth phase. [To Maggie]: As a student, did you ever run into your father on Grounds? Maggie Voth: The way it worked out, most of the times that my dad was in Charlottesville for classes, I was on break. What was it like to walk the Lawn on the same day? 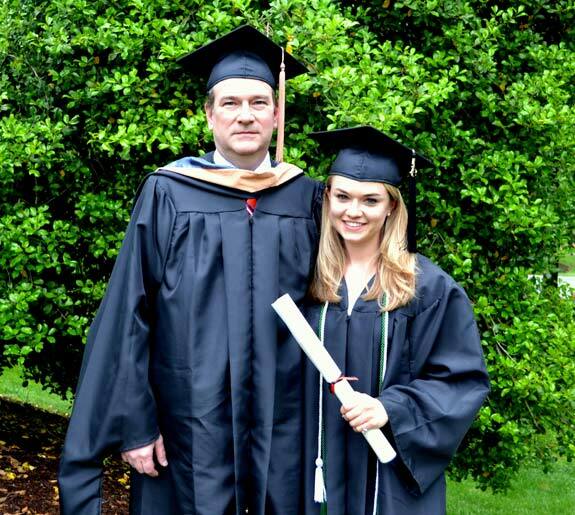 MV: I was excited to have my dad graduating with me. Since we both got tickets, our whole family was able to attend. At Final Exercises, we each walked with our separate schools. I loved every minute of minute of that long walk down the Lawn with my sorority sisters from the College. I had to miss seeing dad get his diploma so I could get over to the biology ceremony on North Grounds. Fortunately, my dad and brother were able to make it to my ceremony just as it was about to begin. It was a memorable day … and a great four years. You just graduated with your B.A. in biology/bioethics. What's next? MV: I have a real interest in health care and have some concerns about where that is headed not only in our country, but also in the developing world. This summer I will begin my career as an analyst with a private company that does government contract work in several areas, including health care. I definitely plan to get a master’s degree at some point, either in public health or a similar field.